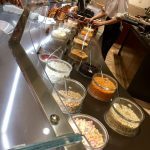 So I’ve decided to dedicate each Thursday’s post to be a throwback of a trip or adventure that I’ve been on so I can share the experiences I’ve already had before I started blogging. 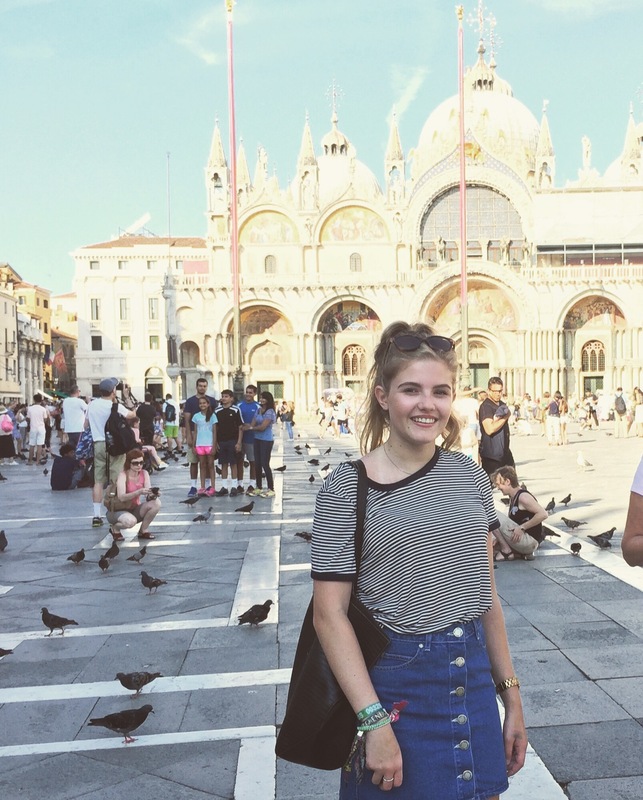 Last summer I went to Venice in July with one of my best friends from uni, Sam. 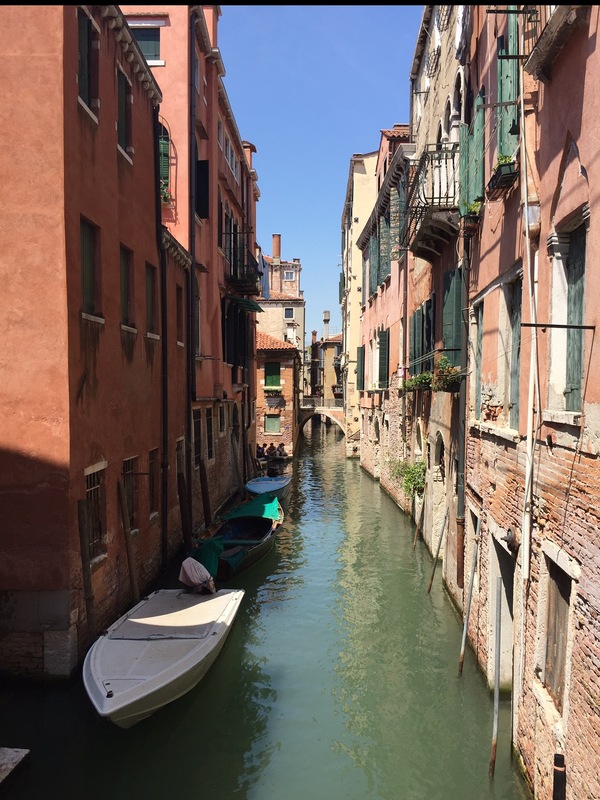 It was a spur of the moment decision one cold winters night that we decided we needed a holiday and we decided we wanted to go to a busy city and what better one to tick off the bucket list than Venice? We spent 4 days in the city and it was amazing! We booked the holiday as a Jet2 City Break, which is great if you don’t want to have to worry about paying additional fees for baggage, finding a hotel with a decent rating and just want a general sense of security surrounding your holiday. It may not have been the cheapest way of travelling but it was still great value for money, especially as Jet2 often run a £200 off promotion for people travelling in pairs! We stayed in the Ca’ Nigra Lagoon Resort Hotel which was right by the Grand Canal and had a beautiful view of the hotel’s walled gardens. I would highly recommend this hotel, it had a rustic feel but was 5 star on cleanliness, location and what’s more the back door/gate in the lobby backed out onto a smaller canal so Gondolas were constant traffic past the windows! 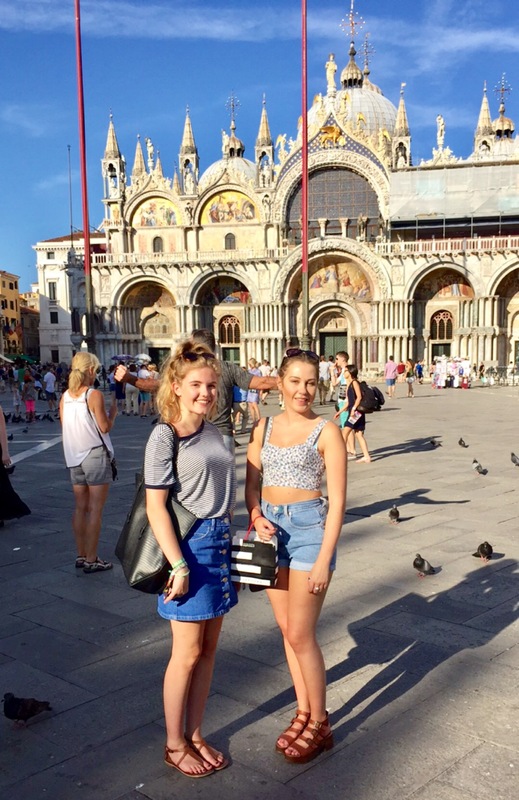 There is so much to see and do whilst in Venice, obviously we took the opportunity to visit St Marks Square (beware of the pigeons) which was as grand in scale as it looks on photos! If you get chance you can visit Florians tea room, which is the oldest cafe in Europe and where you enjoy your coffee whilst being serenaded by piano music! Obviously there is the famous St Marks Basilica, however the queue for this attraction was RIDICULOUS even though we headed to the square especially early to beat the queues. If there is any way to pre- book these tickets I would 100% recommend it as I was dissapointed we missed out. 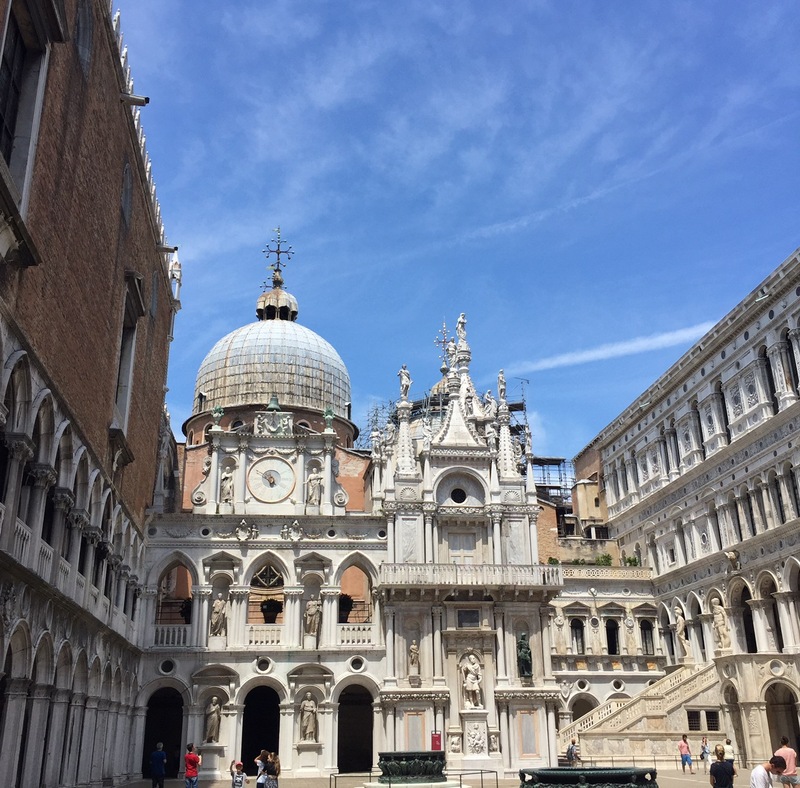 Instead we went to Doge’s Palace (much shorter queue), which was so impressive, the architecture was breathtaking and there were audio guides available in multiple languages to talk you through the many rooms and the main courtyard. Another spot that is a must see is the Rialto Bridge- this is the postcard picture of Venice and to my horror it was under reconstruction works at the time of our visit *mourns the loss of those perfect photos*. I’m pretty certain after all this time it will be back up to its usual grandeur so be sure to pack your camera! Now what kind of girls would we be if we didn’t partake in a bit of shopping? I visited my first ever Sephora whilst in Italy so as you can imagine I was in my element. Now I won’t lie, half of the shopping happened because we were wandering around the cobbled streets lost for hours at a time- IT ALL LOOKS THE SAME! I can’t stress this enough, you need a map!!! The problem with there being so many tiny canals it makes it hard to locate where you are and where you’ve already been so set off for any bookings in plenty of time. Wardrobe wise, it was all shorts, skirts and dresses as the weather was absolutley boiling! Obviously fashion wise it will depend on what time of year you go but the style is very simple but put together- think effortlessly cool ( I had a field day in H&M). I would highly recommend Venice if you’re planning to visit anywhere in Europe, it’s got history, beauty, shopping and gorgeous food! Realistically I think you need at least 3 days but probably no more than 5, so it would be a good city to incorporate into an inter-railing or back packing trip. I loved going here with my bestie, it was so much fun but it would also be a suitable trip for couples, especially around Valentines Day or a special Anniversary, where you could share a romantic gondola trip! So the burning question, would I go back? Yes!! Although I think I would go during winter next time, perhaps during Carnival to see all the cool costumes and masks. Let me know if you have any suggestions of places to go and things to do in Venice! Also let me know if you like the idea of a TBT series to feature some of my previous wanderings. P.S. 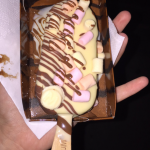 There’s a make your own Magnum shop- need I say more?